After the news of Canada finally legalizing weed, the country has been waiting for the moment that they can purchase the good stuff legally for the first time. However, not only are the new weed shops on every corner making profit from this new law, but so are the public, more specially, Guide Girls. Now, I know what you’re thinking. A Guide Girl? A little Girl Scout like girl, who goes around selling cookies? How is she making a profit from this? Well, little Elina Childs is no fool, and has definitely not been smoking any of the green stuff when she came up with her very clever marketing idea. She thought to herself, what would be the best way to sell a bunch of cookies in under an hour, and then it hit her – the munchies. She told her parents, who thought the idea was great, and went down to the new weed shop in Alberta, Edmonton and set up a stall filled with a large stock of cookies. Entrepreneurship at it's finest ?? 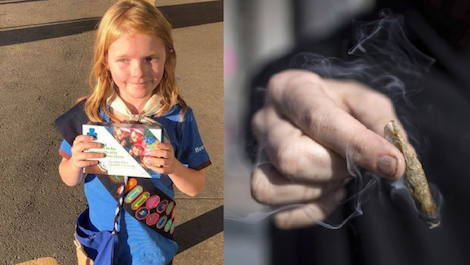 Cannabis was legalised in Canada last week and this 9 year old girl scout stood outside one of the main dispensaries selling her cookies. She sold out in 45 minutes. We’re not sure how Elina came up with this plan, but my thought is that she watched the episode of Friends when Ross has to sell a bunch of cookies and goes to the NYU dorms. “Cookie duuuuuuude” is a line that came to mind when hearing about this little girl and her plan. You’re probably wondering how much the 9-year-old made from this marketing ploy. Well, she made around $120 CAD in just 45 minutes. Forty-five minutes! Although the queues at the dispensary were long, and you would think that those with the munchies would be ravenous, which is no place for a little girl, it was probably the safest option. Her dad, Seann, told CNN, that last year, she got bit by a dog and has been a bit apprehensive of going door-to-door ever since. We don’t blame her, and I imagine those who are high would be too chill to hurt anyone. Apparently, Elina and her cookie stall are now a big hit down the dispensaries, and although she’s not quite sure why she’s so popular down there, we’re sure with the money she’s making, she doesn’t care. Congratulations, Elina! Do you think Elina was very clever with her marketing plan? Do you reckon she’s going to be the next big entrepreneur? Let us know in the comments, or on Twitter at @WhatsTrending.